With this in mind, we wanted to put up a comparison against some of the competing apps on the market and highlight where we think MyNetDiary is truly better. 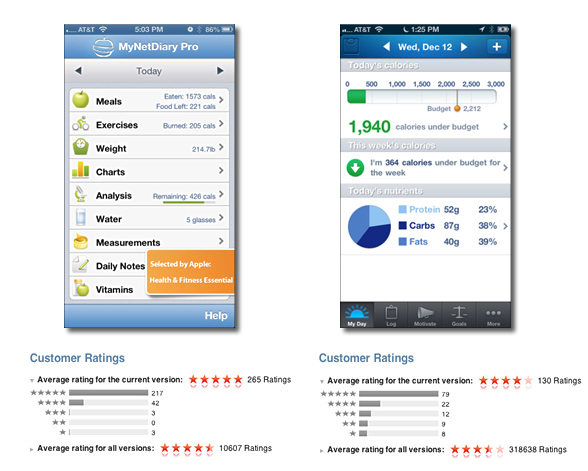 Here we compare MyNetDiary Pro vs. Lose It! – one of the most popular mobile diet apps. Why Lose It! is so popular? First of all, Lose It! app provides very good basic food and exercise tracking and community tools, and as with any diet app or tool (even a paper journal!) helping to count calories, it will help you lose weight! No matter which app you select, as long as you stick to it, it will help you! But, if you pick the app that is easier and faster, you increase your chances of sticking to it! So, the app selection does matter after all. And as you would be able to see below, MyNetDiary apps are much easier and provide much better tools - bigger database, faster food entry, personalized feedback and analysis helping you not only lose weight, but also make better food choices. So, why Lose It! is more popular than MyNetDiary? We believe it has to do with two historical factors: 1) Lose It! was one of a few apps mentioned in Apple's iPhone Superbowl ad, so many more people are aware of it, and 2) Lose It! used to be completely free – it's much easier to pick or recommend a free app than another one with "lite" and paid versions – it is assumed that as some features are available only in the paid app, the "lite" version is inferior to the unconditionally free app. That's not true with MyNetDiary – even MyNetDiary's free app is superior to Lose It! in most areas that matter! Now that Lose It! is no longer completely free and does offer a paid premium upgrades, the comparison becomes more interesting. Food Database – Lose It! used to advertise having about 35,000 foods in its database. It no longer publishes food database size, but based on food vendors added, it hasn't grown much, on our estimates it's about 45,000-50,000 foods. MyNetDiary has 968,000 foods database, and only our team can make changes in this database, improving the food's accuracy and relevancy. Additionally, MyNetDiary Pro and Maximum provide awesome PhotoFood Service – for foods that are not in the database or out-of-date you can send their photos directly from MyNetDiary's iPhone app, which will be verified and entered by MyNetDiary's professional data entry team, resulting in higher quality database. Comprehensive – MyNetDiary tracks up to 45 nutrients, tracks body measurements, vitamins, notes, allows planning in the future days (even the free app! ), provides many charts and supports US and metric measurements. And MyNetDiary keeps it simple – all these features are there when you need them! Lose It! tracks only 9 nutrients including calories. iPad version – in addition to the iPhone, and Android apps, MyNetDiary provides a special iPad app, optimized from the ground up to take full advantage of the large iPad screen. MyNetDiary for iPad get the closest to simplicity and intuitiveness of a paper journal, while providing the same comprehensive, state-of-the-art tracking and diet tools. As all MyNetDiary's apps, it automatically syncs to the "cloud" – MyNetDiary website, so it could be used alongside with another MyNetDiary mobile app. To illustrate more of the differences between MyNetDiary and Lose It!, we put together a special chart. MyNetDiary clearly has many more useful features, but they are well-designed and not cluttered. The most frequent word in user reviews of MyNetDiary is "easy". Everything is easy and everything is there, in MyNetDiary, when you need it. MyNetDiary Pro has a stellar 5-star average rating. We selected a few of many thousands reviews of MyNetDiary on the App Store. I love this app. I started counting calories using the Lose It! app, but found that it was missing a lot of foods. This app has a great database and I love the analysis feature. It helps me get a better overview of how well balanced my diet is on any given day. I would definitely recommend. This app is so much better than other apps similar on the market!! Better than Myfitnesspal, Weight Watchers, or Lose It! So much information that's personalized really help me know what I'm really eating, how my weight is progressing, and what my habits are!!! This is the best app of its kind. I loaded about 5 different calorie counting/exercise tracking apps and erased all of them but this one. Its easy to use and has a huge range of food and exercise to choose from. It's certainly helped me be more honest about my calorie intake and exercise efforts. Some people spell it LoseIt!